The Oahu Council for Army Downsizing is a Council of representatives from diverse organizations throught Oahu with one common interest to support and advocate for the downsizing of Army personnel on Oahu by at least 19,800 as recommended by the US Army in the Special Programmatic Environmental Assessment (SPEA) published June 2014. PBS Hawaii - Insights: How Would Hawaii's Economy Survive Without the Military? The U.S. Army listened to testimony from the community and finally made the correct decision to remove the environmentally offensive Stryker vehicles from Hawaii. Had they listened twelve years ago, billions of dollars could have been saved and acres of concrete would not need to have been poured on Hawaii's aina. Responding to the OCAD's claims that the Stryker brigade could not train to Army standards in Hawaii and maintain its combat readiness, the Army finally acquiesced to common sense and Title 10 (U.S. Code Subtitle B) reality. No longer pressured by Senator Inouye's presence to maintain the facade that these vehicle are needed in Hawaii, the Army made a significant course correction that can be applauded and celebrated. Now if only the facade of Hawaii being a strategic outpost for the Army could be exposed in similar fashion. March of 2014, the Department of Defense (DoD) released its Quadrennial Defense Review for 2014 (QDR 2014). DoD releases a QDR every four years as a way of articulating its strategic direction and providing end strength and force structure decisions for the Services to implement over a fixed period of time. The DoD is facing ever-increasing fiscal challenges and is unable to sustain itself at current and future levels of funding projected by the Congress. In the case of the Army, QDR 2014 calls for a reduction of as many as 130,000 active duty Army soldiers world-wide. To meet this fiscally constrained personnel cap the Army published an Environmental Assessment (EA) identified in bases within 19 States to absorb these cuts; Hawaii is one of the States on the Army’s cut list. Bases in Hawaii now being considered by the Army to meet these cuts include Schofield Barracks (16,000) and Fort Shafter (3,800).The impacts of these cuts are significant, but the members of the Oahu Council for Army Downsizing(OCAD) see most of these as positive impacts that will greatly improve the quality of life for Hawaii’s people, particularly the Hawaiian community on Oahu and throughout Hawaii Nei. The OCAD supports and actively advocates for the downsizing of Army Forces on Oahu. The OCAD does not consider the bulk of the Army’s forces on Oahu to be strategically located since these forces do not have readily available airlift or sealift to support their transport to anywhere in the Pacific as quickly as may be needed. Moreover, the OCAD believes the Army on Oahu lacks critically needed ‘forced entry’ capability to allow it to enter hostile environments, a capability already possessed by the US Marines presently on Oahu and throughout the Pacific. The OCAD believes taxpayers cannot afford to pay for redundant forces competing to do the same job and redundant, geographically isolated forces occupying critical lands and consuming valuable resources that are important to the State of Hawaii and the Hawaiian community. The OCAD wants the people of Hawaii and Oahu to understand the goodness that can occur if the Army is downsized in the quantities proposed by DoD. The OCAD believes the cuts proposed should occur in the near term and that the following bases and geographic areas be returned to the State of Hawaii: Schofield Barracks, Wheeler Army Airfield, Makua Valley, Dillingham Military Reservation, and Kolekole pass with unimpeded access on Lualualei Naval Road. The Army Announced in July 2014 that due to Department of Defense (DoD) requirements under QDR 2014 it would cut its forces by as many as 130,000 personnel; down to as few as 420,000 military personnel when FY 2016 Sequestration manifested itself. A year later in July of 2015, the Army announced it would make only 40,000 military personnel cuts and 17,000 Army civilian employee cuts and it identified which units were to absorb the losses. In actuality, only 18,967 military personnel cuts were made that directly affected active Army units, a very small portion of the originally announced 100,000 to 130,000 personnel. In October of 2015, Congress passed the Bipartisan Budget Act of 2015, which funded DoD in such a way that prevented it from any sequestration mandated cuts and thereby ended any further Army personnel cuts and even restored some that had already been announced. In essence, the Congress and the Obama Administration stopped any fiscal reform of the Defense Department as mandated by the QDR process and any supposed automatic spending cuts dictated by the sequestration and the Budget Control Act of 2011. Political will could not stomach necessary and even legally mandated budget cuts that would more effectively align military force structure with its strategic mission requirements and fiscal realities. On a positive note, the Army decided it will remove the Stryker vehicles from the force structure in Hawaii and reorganize the 2/25 SBCT into a two maneuver battalion infantry brigade combat team. Unfortunately, this still leaves two obscenely expensive, conventional warfare brigades and their support forces isolated in the middle of the pacific with the misguided political belief they are trickling down some rightful share of economic welfare to the people of Hawaii. As part of the U.S. Army’s announcement today on this first round of Army downsizing decisions, the 25th Infantry Division’s 2nd Brigade Combat Team will remain a brigade combat team, but will convert its primary maneuver platform, officials said. 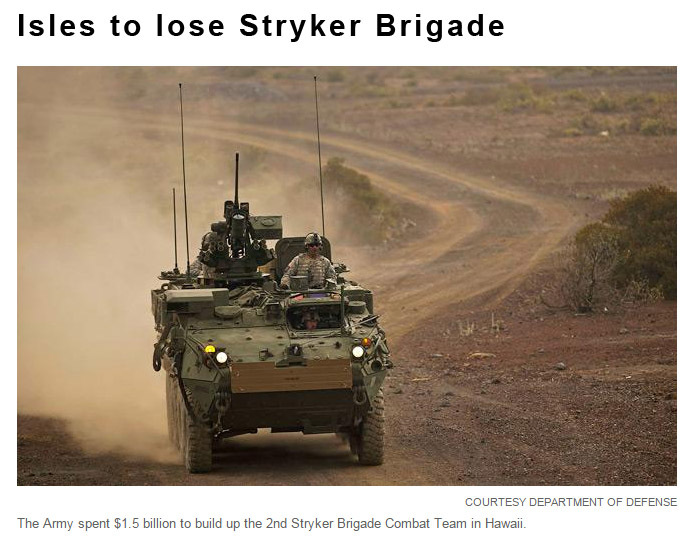 Currently a Stryker brigade combat team, it will become an infantry brigade combat team without Stryker combat vehicles. In regards to the number of personnel on Oahu that will be cut by the Army (1,214 soldiers for Schofield Barracks and 229 for Fort Shafter), Frenzel stated that this is the first announcement of several to come. If no change takes place regarding sequestration spending caps scheduled to return in October, the Army’s end-strength will be further reduced to 420,000 soldiers. Frenzel said at this point the numbers announced are a little confusing; announced cuts to bases amount to less than 19,000 personnel (far less than the 40,000 soldier cuts and 17,000 Army civilian cuts to be made). Frenzel speculates that the Army might be cutting its personnel float (soldiers in transition and not directly assigned to a base) which is basically a numbers game that will later haunt the Army by taking away much needed personnel management flexibility. Moreover, it will make the next round of cuts very painful for the Army, forcing them to cut deep into combat forces, including those on Oahu.